MCT Watches and the artist Anish Kapoor present the world premiere Sequential One – S110 Evo Vantablack, the first watch to feature the blackest material ever produced by humankind, Vantablack. The Sequential One – S110 Evo Vantablack stems from an encounter between Anish Kapoor and MCT Watches starring this high-tech material with its extremely strange properties. Representing an authentic scientific revolution, Vantablack is composed of carbon nanotubes measuring one millionth of a millimetre thick each and capable of absorbing 99.965 per cent of the light they receive. Initially developed for the military and aerospace industry, Vantablack soon caught the interest of Anish Kapoor. As the artist explains, “it’s the blackest material in the universe, after a black hole; a physical object that is impossible to see”. For several months, the teams at MCT Watches worked hand in hand with the artist in order to give shape to a mysterious and fascinating watch. Used on the back dial as well as on one end of the minutes hand, shaped like a small moon, Vantablack reveals its incredible properties. The movement appears to be suspended in mid-air, while the small moon appears and disappears as if by magic during its rotation around the dial. Derived from the Sequential One – S110 Evo, this 10-piece limited series is equipped with the original manual-winding Manufacture movement with its 471 components including 81 jewels, as well as the brand’s sequential display of the hours on prisms. 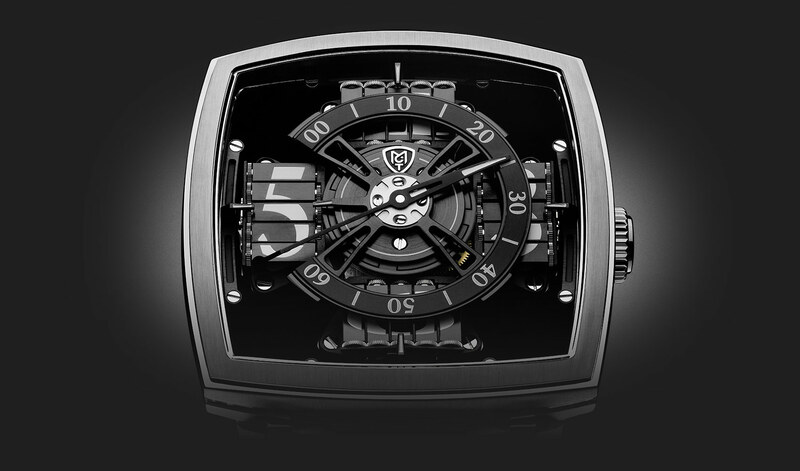 The case of the Sequential One – S110 Evo Vantablack is forged from black DLCcoated titanium. Each watch is signed by Anish Kapoor. Sequential indication of the hour on prisms. Minutes indication on 270° sector. MCT-S1.0 hand-winding movement, developed and assembled by MCT. Composed of 471 pieces. Bridges hand-chamfered and adorned with “Côtes de Genève”. Traditional Breguet terminal curve. Patented system for accumulation of energy. Frequency 18,000 A/h (2.5Hz). Power reserve of 50 hours. 81 Rubies. 45.00 x 45.00mm, H 15.50mm in centre and, 6mm on the edges. Crafted from Titanium Grade 5, DLC coated composed of 50 components. Front cambered crystal made of sapphire with double anti-reflective coating. Rear crystal made of sapphire with anti-reflective coating on the inside side. Middle crystal made of sapphire. Hours: made of 4 modules composed of 5 triangular prisms each. Minutes: indication of a rotated dial. Alligator inner leather, handed stitched, triple deployment clasp, in steel. 30 meters / 3 ATM / 100 feets.